Sam Ramji gave an excellent short talk at OSCON 2007 on Linux and Windows Interoperability: On the Metal and on the Wire. Sam described the collaborative work being done inside the Microsoft open source labs to better enable virtualization with the Xen world. What is the patent landscape around virtualization? What is Microsoft's position with respect to Xen and Xensource if someone were to attempt a patent run against the project? Patents with International Business Machines and containing "virtualization" (130) !!! It's a potentially messy space. As virtualization lives so firmly on the hardware/firmware/software boundary, we don't even need to have the debate over the relevance and merits (or lack thereof) of software patents. Somewhere in that collection of patents there are likely to be hardware patents, or firmware patents indistinguishable from hardware, and they may read on the Xen space. Which brings us to the second question. Here is a perfect (and safe) opportunity for Microsoft to get out ahead of the curve, and demonstrate that they can learn and that they do "get it" and indeed that they can lead with respect to the licensing debate. They can make the patent grant, here and now, to the Xen project. As an intellectually interesting challenge for their legal team, they would be creating a deliberate license directly related to a project licensed under the GPL and stating (within their control) how their patent license does apply downstream, so as to not interfere with their assertion of patent rights in other areas. The point would be to see how promiscuous they could be with their patent rights in a well defined way. Sort of an interesting idea. Indeed, it becomes a historical and game changing idea with respect to their competitors. Of course hell could freeze over too. But it's great to dream. Tim O'Reilly tried interviewing Eben Moglen on licensing in the "Web 2.0" era as one of the sessions at the O'Reilly Radar Executive Briefing. I believe his intent was to expand the discussion he began a year ago when he suggested "open source licenses are obsolete." I haven't seen Tim on stage before with someone directly involved in the freedom discussion to the level of Eben. It perfectly cast the debate into positions that I believe are by definition incompatible and incongruous. Jane Jacobs (originally famous for "The Death and Life of Great American Cities") wrote a small Socratic dialog called "Systems of Survival". The characters debate that there are exactly two value systems in existence. One leads to politics (protecting) and the other to commerce (trading). These value systems are not opposite ends of a spectrum, but rather different and incompatible. For each value in one syndrome there is no equal and opposite value in the other. I've long maintained in my free and open source software talks that we have understood communities since "you had a campfire and I wanted to sit beside it." That metaphorical campfire perfectly frames the value systems debate as well. Am I allowed to sit beside the fire because you're acting as protector? (And when will you begin to tax me firewood?) Or did I trade to sit beside the campfire. Neither value system is inherently "better" than the other, indeed they each serve their adherents and proponents well (which was Jacobs's point). But neither can they be mixed together. (They are not along a continuum.) One sees this every day. Businesses and governments have an uneasy alliance in policy, regulation and legislation. But while trading is as old as communities, the growth of the economy over the past ~200 years owes much to government legislation enabling limited liability, joint ownership companies and the shared risk investment in capital that was thus enabled. Tim is the embodiment of the trading value system. 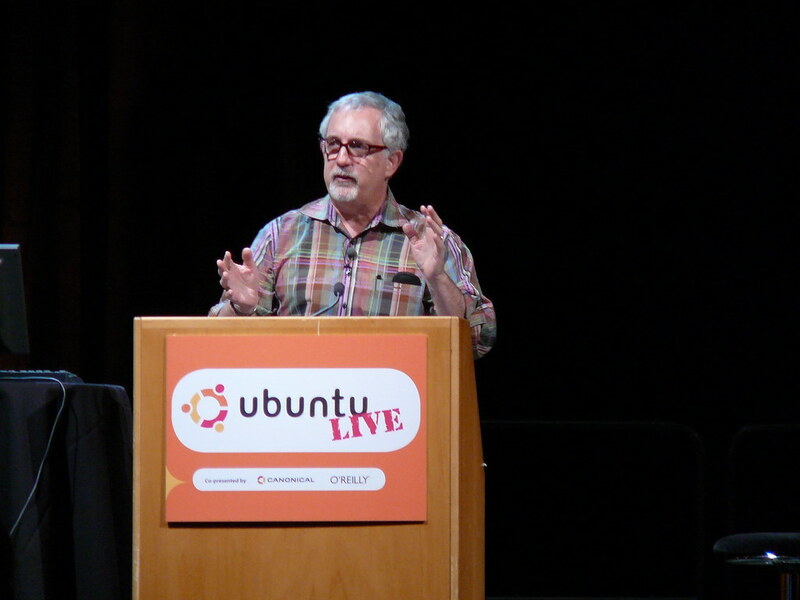 Indeed, I would suggest that not only was the attack on stage unwarranted, but that the Free Software movement has been able to deliver its important message to a broader audience faster because of the stage Tim built with O'Reilly Media. Likewise Eben is a veritable intellectual and rhetorical lion for our political value system around software freedom. Eben may be the perfect person to engage in the necessary debate going forward around conflicts of rights that I believe are invariably created by friction between the two value systems. Hopefully the debate is not lost in the unfortunate heat and noise arising last week on stage. GPL Whiz Moglen nails Web 2.0 O'Reilly on "frivolous" charges by Ashlee Vance of the Register. 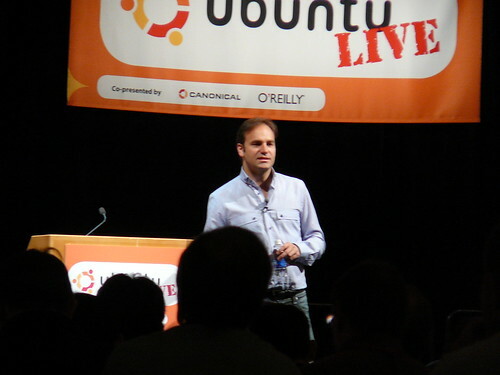 It's 9 AM on SUNDAY morning and at this unconscionable hour I was sitting in a room with 200 people for Mark Shuttleworth's opening keynote at Ubuntu Live. 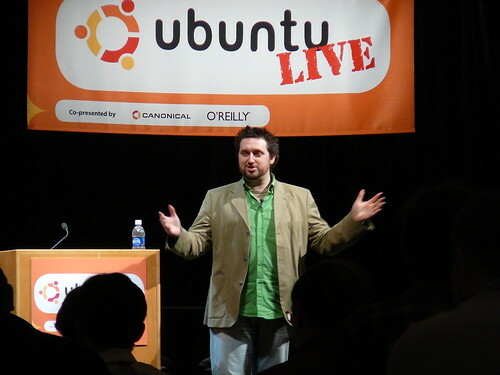 This three day event runs Sunday 22 July through Tuesday 24 July, and has been organized by Canonical and O'Reilly Media. 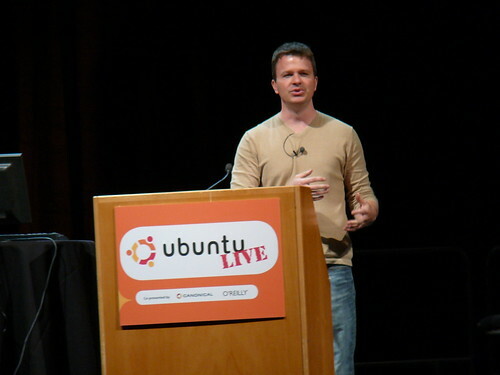 Mark gave an excellent keynote (as he is prone to do), talking about the rise of Ubuntu over the past three years, and looking forward to the evolution of quality, engagements, and commerce over the next three years. 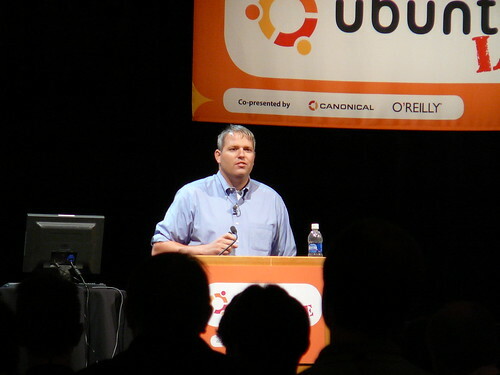 He acknowledged his partners at Dell, Sun, Intel and Open Moko, building on the themes that the time is now to demonstrate that open source has arrived beyond the data centre, and it's time to take Linux to a much broader audience. In doing so, however, he was NOT looking at Ubuntu as simply a better desktop, but rather enabling people beyond the desktop. Stephen O'Grady (Redmonk) was the next keynote. He built on the morning's keynote theme of collaboration, pointing out that apt-get is sufficient magic (per Clarke's Third Law on Predictions), and going on to explore the idea of distributed support. Essentially connecting the community and the software would be like app-get for people (support) and not just software. Jeff Waugh provided the last keynote of the morning. In his inimitable style, he gave a presentation on "Fierce Freedom" and "Fierce Commerce". Jeff walked people through some of the learnings of the Ubuntu community that came from the Python, Gnome, and Debian community experiences. The afternoon keynote's were kicked off with a great presentation by Eben Moglen. 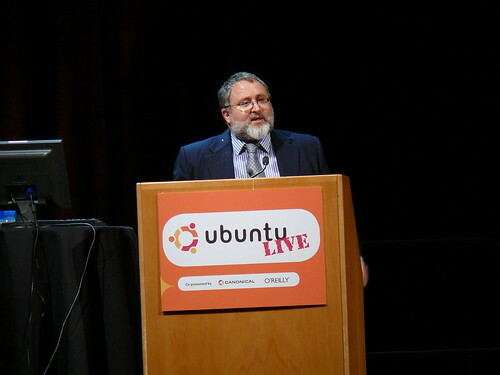 He discussed his satisfaction and pride in the community in the development of the GPLv3, not because it's a better license, but in the demonstration of collaborative community development in an open and democratic process that transcended the entire free software community (corporate, academic, legal, and development). Mitch Kapor was next up. He talked about his own evolution from proprietary developer in the mid-eighties to his belief in free and open source software development. He then made a number of interesting observations about the social implications of open source. Early developers at this point (early as in high school aged people) are living in open source worlds -- it is quite possible that the socialization of open sourcce will mean the next generation of developers will believe that this is the way it's always been. Mitch pointed out that open source software has moved from margin to mainstream in a single human generation (~20 years). Open source software is enormously empowering, especially to those in marginalized situations, and he built on the theme that it is also an amazing model for getting things done in a transparent and collaborative way. Indeed, it is a form of democratic renewal that is so badly needed socially. Jim Zemlin (Linux Foundation) finished the afternoon's keynotes, outlining the mandate of the Linux Foundation and their commitment to helping the community.